check out There's No Place Like Home: Tales and Treats from a Mennonite Family. We (Steve and Sharon) completed a "love songs" recording. Find out more about the CD recording. To order email NYM. 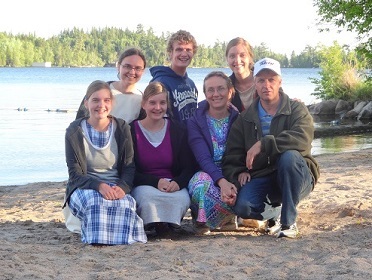 Our family is from Longbow Lake, Ontario, Canada. We live among the rocks, trees and lakes of northern Ontario, as you can see in our photo. Your books remind me of The Little House series by Laura Ingalls Wilder. It was a great experience writing and self-publishing (March, 2002) and then marketing my first book Homeschooling Moments and Child-Friendly Recipes. In August 2002 a second printing was done. In March 2004 I published my sequel to Homeschooling Moments and Child-Friendly Recipes-A Collection of the Unique Adventures of a Mennonite Family. My second book is entitled, There's No Place Like Home-Tales and Treats from a Mennonite Family. While I enjoyed self-publishing, I felt ready to turn more of the marketing and business aspect over to a publisher. I wanted to focus more of my energy on writing. So I was thrilled when a publisher was willing to work with me in 2009 to publish Little Praire Girl. Since then, my next two books in this series were also published. "I checked out your website, Sharon. Your book (Homeschooling Moments and Child-Friendly Recipes) sounds helpful, encouraging, and funny! This page was created and is maintained by Sharon Schnupp Kuepfer. Please email me if you encounter any problems with this page.